Each week on campus, I take many pictures–events, people, scenes, moments of life at Fredonia. In this blog, I will be sharing at least one photograph each week, with comments about the subject, as I see it through the lens of my office, 138 Fenton Hall. This fountain near the Williams Center patio reminds me of several important ideas. 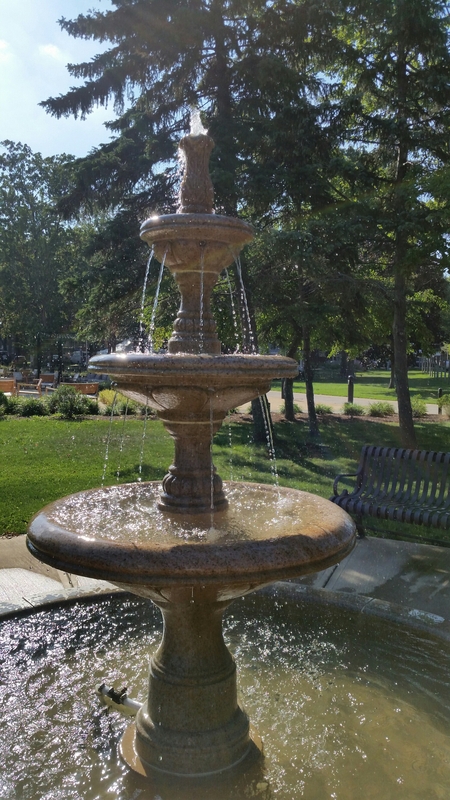 A gift of the Class of 2015, the fountain is a beautiful addition to the campus, offering opportunity for a few tranquil minutes to those passing by. That class hoped it would be used for wishing, with new and current students tossing coins in as they think about their hopes and dreams–and graduating students thinking about their lives ahead. In fact, funds from tossed coins are donated to the Make A Wish Foundation, at the class’s request. So walking by the fountain on Move-In Day, I made these wishes for new students: that you find friends, challenging courses, people who support you in your learning and personal growth. Beginning in a new place is hard, and I know that it can be lonely. Toss a coin in the fountain, and make a wish. Then get to class, spend an hour in the library, take the first step to invite someone to lunch, join a club, and volunteer on a service project. This is your campus, and my wish is that you’ll be at home here in no time.